Terry Polen, West Virginia DEP Ombudsman, explains the proposed aboveground storage tank regulations to farmers and businessmen in the Eastern Panhandle. After a chemical spill contaminated the drinking water for 300,000 West Virginians, state lawmakers passed a bill to regulate above ground storage tanks in the hopes of preventing it from happening again. Just a few weeks ago, the West Virginia Department of Environmental Protection released some guidelines for tank owners on how to interpret that law until their inspection program is finalized later this year. 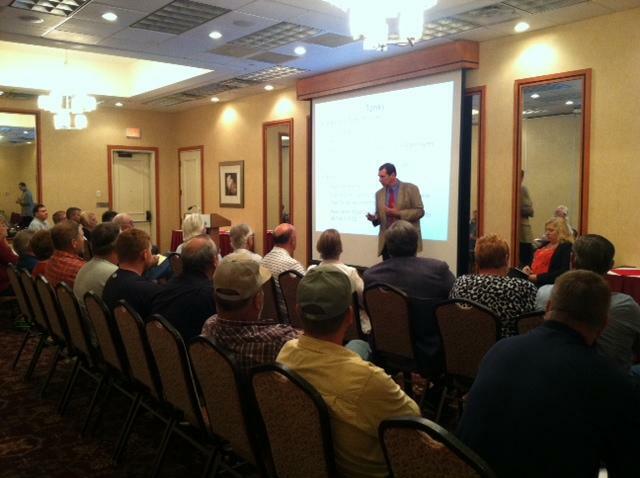 The DEP held an informational meeting in Martinsburg yesterday to hear the concerns of tank owners and collect comments on their new program. The informational session on the proposed Aboveground Storage Tank Program was met with...distaste from the forty or so in attendance. The majority of those people were farmers living and working in the eastern panhandle whose storage tanks would be directly affected by the new proposed rules. And the overall feeling...was not one of pleasure. And Hough wasn’t the only one who was upset. Most of the other farmers refused an interview, but many did say during the meeting that they had either milk tanks or water tanks and just couldn’t understand the need for them to be regulated. One woman even expressed outrage on how she would adequately regulate a water trough for her farm animals. Under this proposed program, all aboveground storage tanks in the state would have to be regulated by the DEP if they have the capacity to hold 1,320 gallons or more of liquid, are 90 percent or more above ground, and are at a fixed location for at least 60 days. It’s estimated that this could affect as many as 80,000 tanks used in a variety of industries and for a multitude of purposes. Last month, DEP Secretary, Randy Huffman entered an emergency rule meant to guide tank owners through the inspection process described in law until his department can fully implement the tank inspection program. That rule said tanks would be categorized in three groups with varying inspection levels for each. Tanks like Hough's that contain water or food based products must be registered and inspected by the January 1st deadline, but can be inspected by the owner or a designee. Only tanks containing hazardous materials, holding more than 50 thousand gallons of a substance or located near a public water supply must be inspected by a certified engineer. Dr. Terry Polen, West Virginia DEP Ombudsman, a person who investigates individuals’ complaints, led the meeting. “I’m going to go through a short overview of this, and then allow folks to make comments and then I will take those comments back to the agency to those people that are actually drafting the bills. If changes need to be made, if people think that changes need to be made, then their voice needs to be heard,” said Polen. The draft interpretive rule is out for public comment through October 9th. That rule will set the framework for the final above ground storage tank program for the DEP.